Fortunes and reputations are being forged right now on the blazing hot Amazon Kindle e-reader. Every single day, thousands of ebooks are being purchased and downloaded with the push of a button. In fact, Amazon.com now sells more ebooks than physical books - this is a tectonic shift in the landscape of the book publishing world. And, the beautiful thing is. ... Amazon makes it drop-dead easy to jump on the Kindle Publishing bandwagon. Amazon actually wants you to create products to sell through their online stores (special ones requiring no inventory or profit splits with publishing houses.) It is not just e-books they will help you to create and sell. Amazon has spent years building publishing platforms for physical products like books, CDs, and DVDs (that service is called CreateSpace) and the digital publishing platform for Kindle called Kindle Direct Publishing. Taking advantage of the Kindle Direct Publishing tools gives you fast and easy access to one of the worlds biggest (and most trusted) online sales platforms. Check out Amazon's CreateSpace publishing service for more details on how you can publish your information products in physical formats. 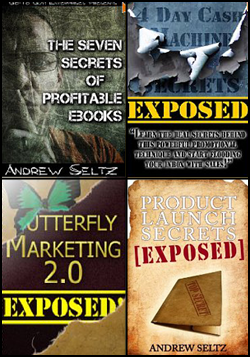 The process of marketing ebooks on the Kindle is not dramatically different than publishing in any other digital format. You still need to do good research (the Amazon Bestseller lists are excellent resources here) and plan and write a good product. You still need to create a salespage style website and write some compelling sales copy. And you need to get out and drive traffic to your offer. The big difference for publishing on the Kindle is that you will need to format your book properly and use the Kindle Digital Publishing tools to upload, proofread, and publish your ebook on the Amazon website. The Kindle ebook format is not much more than a stripped-down version of HTML with a couple of custom tags to help you establish chapter breaks, etc. A full set of instructions (and a publisher's discussion forum) are available on the KDP site. There are a number of resources and services available to do the conversion work if you'd rather pay someone else and avoid the learning curve. This is a useful Amazon Kindle ebook template for Microsoft Word that can help you bypass the learning curve. You can also check out our free template for OpenOffice/LibreOffice. Finally, the Ultimate e-Book Creator Software gives you a WYSIWYG tool that makes formatting e-books as easy as using a word processor. The process of publishing your digital content on the Kindle is both cheap and easy. I've done it myself and recommend you give it a try. Millions of Kindle owners are out there waiting for you!